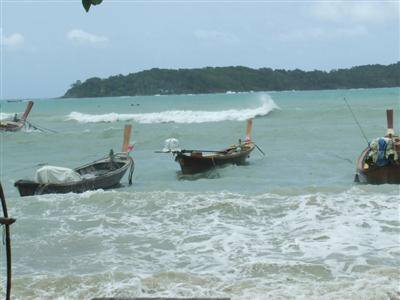 RAWAI, PHUKET: Threats of beatings and electrocution by loan sharks have abated for scores of Moken sea gypsies since a Phuket-based community organization stepped in to help. The ‘Poor’s Right to Develop Phuket Network’ (PRDPN) paid off debts worth more than half a million baht for 162 Rawai sea gypsies earlier this month. Nevertheless, hundreds of residents of the sea gypsy village near Rawai Beach remain in debt and living in fear of punishment. The loan sharks, themselves residents of the village, charge interest of up to 60 percent for loans over periods as short as 15 days. The creditors threatened those who couldn’t pay with a punishment they called ‘2-7-2’: two kicks, seven punches and two electric shocks. Villagers said they were forced to take out loans because on many days during the monsoon season they couldn’t go fishing, which is their usual source of income. Sucheep Janrung, 60, said the PRDPN had repaid thousands of baht of her debts, but she still owed 3,000 baht and lived in fear of punishment. She said she had seen people who couldn’t pay being taken away and beaten. “One lady who sold somtam for a living came to live in the village and ended up 50,000 baht in debt,” she said. Mrs Sucheep said she wasn’t aware of anyone being electrocuted but feared it would happen to her if she couldn’t pay. “Even if I die, the debt will move onto my family and they’ll have to pay,” she said. Chalong Police in early June arrested six members of a gang who entered the same Community to collect on loans, confiscating a list of 35 debtors and 11,000 baht in cash. Police estimate there are over 40 loan shark gangs operating on the island.